​Be part of the 65ROSES Augusta Team and make a difference in the life of someone with Cystic Fibrosis! In the heart of every runner is a reason we run! 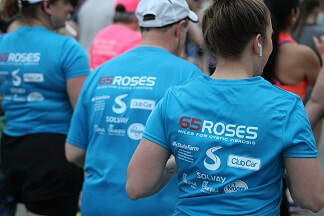 Team members of 65ROSES Augusta, a charity affiliate team of this event, run to support local cystic fibrosis patients/families in the Augusta community. 1. JOIN -Register for the race here and make sure to choose the 65ROSES Augusta team. Use our PROMO CODE 65ROSES to receive $10 off your registration. 2. COLLECT DONATIONS through our website. See our Fundraise page for more information. 3. T-SHIRT PURCHASE - If you would like a 65ROSES Augusta team t-shirt, make a $15 donation using the button on this page. 4. INVITE OTHER RUNNERS - We can all work together to meet our goal of $10,000 for this year's race by running...Miles for Cystic Fibrosis!! ​Thank you to our wonderful sponsors! Cystic Fibrosis Foundation. Click here to go to their website. ​In addition, through our BreatheStrong exercise grant program, Miles for CF encourages healthy physical activities for children and adults living with cystic fibrosis. Click here for application.